Never too late to enroll, never too late to change your life! Born on 13 November 1957, he graduated in architecture from Politecnico di Milano in 1984 and started his professional career in 1986 when he founded the architecture studio AD architettura. He has gained considerable professional experience in the field of architecture (residential and commercial buildings, conservation renovation and restoration, hotels), interior design, art direction and design in the furnishing sector, consultancy, design and art direction of furniture showrooms. One of his main creations is the “Piramide” laboratory for the Everest-K2-CNR scientific committee, designed for the Consiglio Nazionale delle Ricerche (Italian National Research Council), set up in Nepal in 1991 at an altitude of 5050 m. Used as a high-altitude research laboratory, it was selected for the 18th Triennale di Milano. GINEVRA - designed by Massimo Castagna+Christophe Pillet for Rossana- is a softly technical kitchen. Composed of four individual designs which can be integrated with each other: Ginevra kitchen system, based on a cabinet door which is rigorous and basic. Glass System, semi-reflective glass used as a supporting and structural element, Wall System, innovations in glass backs and a system of columns. 4 elements, four aces, where warm essences meet raw materials such as shiny glass, steel and silver-plated granite. Wine and food reference: truffle and ovule salad. Motto: Synergies between minimalist style and taste for sartorial details that elevate the concept and differentiate the product. Timeless elegance, originality and quality: these are the strengths that have always characterized Novalinea and a kitchen that allowed the company to reach the highest peaks of the market both in Italy and abroad. Today, thanks to his decades of experience, Novalinea interprets a young market, dynamic, ever-changing offering, alongside the most successful models of the past, with new compositions that look vigorous and energetic look to the future. Strength, rigor and sobriety, a pure beauty, with no heavy duplication: these are the values that make it unique and inimitable kitchens Novalinea and that the new brand will attempt to summarize with its clean lines and colors with strong visual impact. The aesthetic solutions are supported by a continuous technological research designed to ensure formal and business are always competitive and innovative. The great professionalism of the workers and collaborating with design studios young and innovative solutions allow to realize the functional and fine quality that you lend themselves to infinite compositions highly customizable in the selection of measures, finishes and colors. Novalinea aims to listen and to meet all the needs of those who played with freedom and versatility of the space that has always been at the heart of every home. The simplicity of everyday life, the joy of the holidays, the excitement of a special moment: the kitchen tells all this and much more. The company developed following collections, with endless configurations and wide selection of finishes: maia, logika, petra, riccione, theca, track, vollee. Valuable insight from an idea that has taken shape thanks to a complex design work and intensive technological research became a reality. Highest quality materials, precious woods, sharp lines that draw the net volume of room to customize and give life to a kitchen full of character, with a strong visual impact and technologically advanced. Again Novalinea pushes his gaze beyond the boundaries of tradition and conventions housing interpreting the kitchen as a space more versatile and dynamic, able to meet the style and needs of those living there. Stylish, innovative, functional Maia embodies all the qualities that have always distinguished the kitchens Novalinea . Intelligent, geometric, balanced, in a word Logika. The doors on a board with horizontal opening in the throat (throat or vertical columns) lead the eye to the discovery of a space made ? ?of simple lines that mark the net volume and determined. The suspended bases, equipped with anti-tilt system, give it an unmistakable touch of lightness and absolute modernity. Surprise and conquer the columns with retractable doors that, with a simple gesture, to reveal their internal built-in appliances that can show or hide a kitchen with discretion because Logika always knows how to impress. Distinctive columns with retractable doors Concepta 30. It 's the ideal solution to reduce clutter in the early stages of operation and hide discreetly when not in use. The warmth and solidity of wood meet with the shimmering reflections of the steel forging a kitchen from the intense character, technologically advanced and aesthetically flawless. The choice of the highest quality materials is also reflected in the details: from niches, available in various sizes and coated the timeless majesty of gold and silver leaf, to handle, Novalinea design, brushed steel or declined in the gunmetal color. cuisine valuable, but not only. Theca offers high performance solutions that simplify our daily actions, such as the innovative hob sight with removable magnetic funnel that make cleaning faster and more accurate .... because beauty has more value when it knows also be helpful. 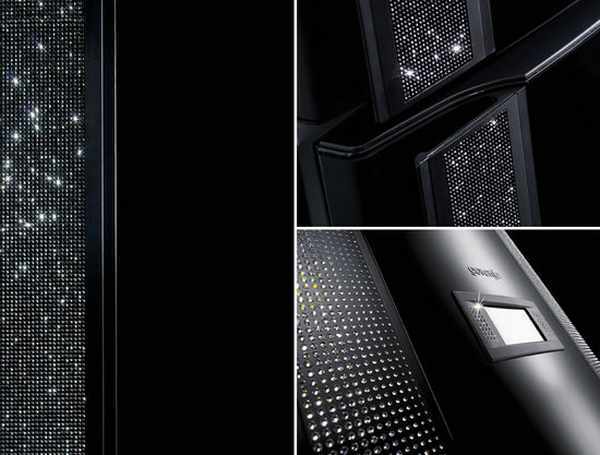 The Eye-catcher from Gorenje is a black refrigerator that features 7000 hand embedded crystals from Swarovski. 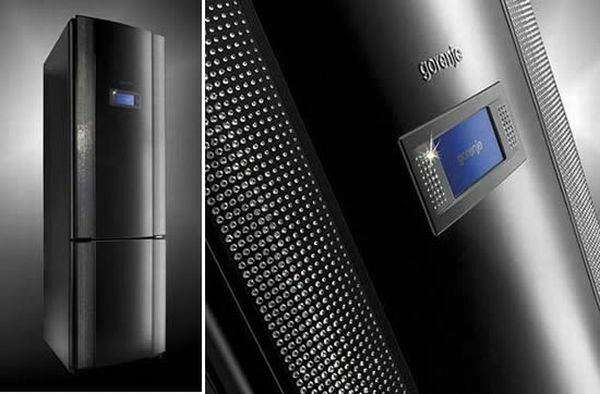 The appliance is controlled by a touch screen mounted conveniently at eye level. Just is case diamonds aren't enough for you it also comes equipped with a built-in radio, recipe book and voice memo recorder/player. Now don't get too excited because they are only producing 10 of these masterpieces. Successfully merging the old with the new was the key to this extensive renovation. The existing house – a grand, three-storey 1960s home on a prime riverside site – has been completely remodelled inside and out. Not surprisingly, a new kitchen is at the heart of the home. Designer Lee Hardcastle of Enigma Interiors says the original kitchen was smaller and did not lend itself to modern living. "It was rather hidden and it was an awkward space. The owners, Andrew and Karen Baildon, wanted to make a statement with their new kitchen. It needed to be beautiful and uncluttered, with a separate work area at the rear." The ground floor area was subsequently remodelled and several walls removed to create a spacious kitchen and open-ended scullery within an extra-large family living area that opens up to the outdoors. Hardcastle says it was important to maintain the traditional character of the older home. "The owners have always admired the Art Deco period, and this greatly influenced the design," he says. "The home already boasted large columns and archways, timber floors and Art Deco detailing." Hardcastle, who worked closely with Karen Baildon on the project, says she had collected many images, mostly featuring American projects. "Many of these designs expressed a Georgian feel. This also helped to determine the design of the hand-painted cabinetry, which features simple recessed panel doors and fluted glass display cabinets with a distinctive diamond pattern. "The cabinets even show slight brush marks, which ensures they can be touched up easily if needed." Hardcastle says a central island was another request – as well as providing plenty of bench space, this needed to accommodate dining seating and bar stools. The L shape evolved from these requirements. One end of the island forms a bar top, while velvet banquette seating wraps the inside of the L. The exposed peninsula on the island is supported by a square-edged column on a pedestal base. A similar base features on the banquette seating – this is highlighted by a subtle repetition of the diamond motif. "We also introduced this pattern to the wall above the range," says the designer. 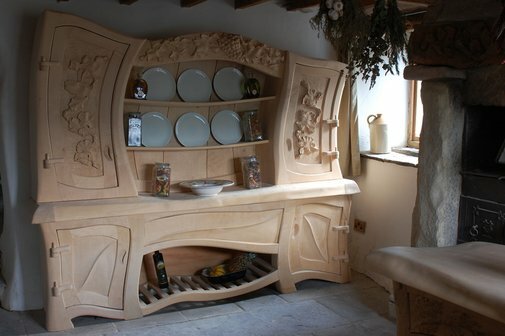 "And the motif reappears on display cabinets in the scullery, which can be seen from the kitchen. This provides visual balance, but the pattern is used sparingly so that it doesn't overwhelm the space." In keeping with the need to retain a traditional character, all the modern appliances are integrated or concealed in the scullery. The bank of cabinets on the side wall conceal a large refrigerator and freezer, while the island hides a dishwasher and a large refrigerator drawer. But a traditional black Falcon range takes pride of place in a hearth-style cooking centre. White subway tiles line the splashback and the outside walls of the centre, creating a highly practical surface. Few mode days until the opening of the largest kitchen fair in the world! For the subtle play of textures and finishes, for the balanced juxtaposition of volumes and planes. Initially I thought this is a digital manipulation on Photoshop, but actually this cabinet comes from a real company from UK.